(Nanowerk News) Researchers at the University of Tokyo have revealed a novel magnetic structure named the “Devil’s staircase” in cobalt oxides using soft X-rays ("Observation of a Devil’s Staircase in the Novel Spin-Valve System SrCo6O11"). This is an important result since the researchers succeeded in determining the detailed magnetic structure of a very small single crystal invisible to the human eye. Recent remarkable progress in resonant soft x-ray diffraction performed in synchrotron facilities has made it possible to determine spin ordering (magnetic structure) in small-volume samples including thin films and nanostructures, and thus is expected to lead not only to advances in materials science but also application to spintronics, a technology which is expected to form the basis of future electronic devices. Cobalt oxide is known as one material that is suitable for spintronics applications, but its magnetic structure was not fully understood. The research group of Associate Professor Hiroki Wada at the University of Tokyo Institute for Solid State Physics, together with the researchers at Kyoto University and in Germany, performed a resonant soft X-ray diffraction study of cobalt (Co) oxides in the synchrotron facility BESSY II in Germany. They observed all the spin orderings which are theoretically possible and determined how these orderings change with the application of magnetic fields. 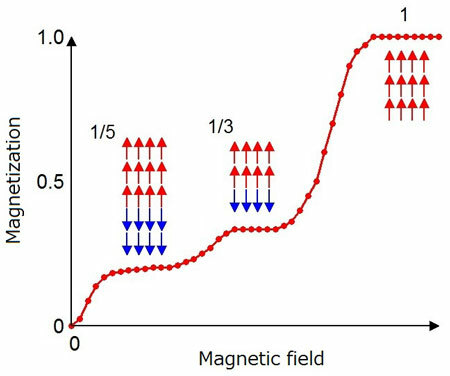 The plateau-like behavior of magnetic structure as a function of magnetic field is called the “Devil’s staircase,” and is the first such discovery in spin systems in 3D transition metal oxides including cobalt, iron, manganese. By further resonant soft X-ray diffraction studies, one can expect to find similar “Devil’s staircase” behavior in other materials. By increasing the spatial resolution of microscopic observation of the “Devil’s staircase” may lead to the development of novel types of spintronics materials.